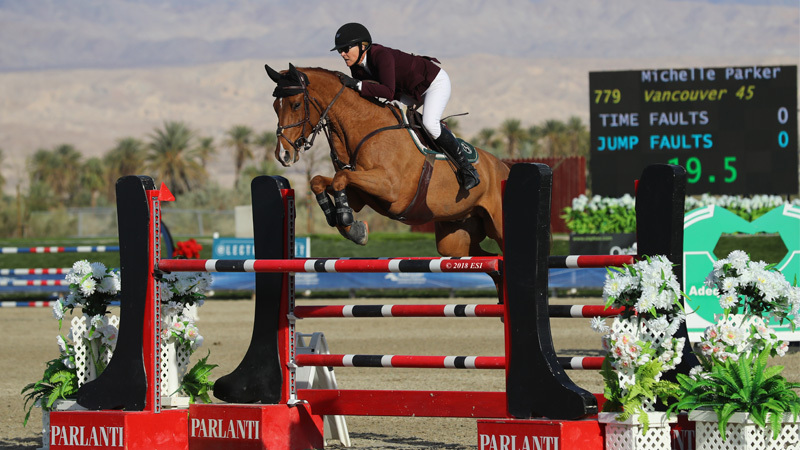 The first grand prix of the HITS Coachella Desert Circuit did not disappoint, starting with 31 talented horse-and-rider pairs in the first round and culminating in a down-to-the-wire jump-off. And Michelle Parker got the circuit off to a good start with a win aboard Vancouver 45. “My other mount, Cupilor, is not going right now, so Vancouver is my only grand prix horse. Cupilor wins a lot, so Vancouver has had some big shoes to fill, but he’s doing a good job of it,” Parker said. The first round of the $70,000 Back on Track Grand Prix consisted of 15 jumping efforts including one double and one triple combination, designed by Martin Otto of Germany. Jumping faults were spread around the course, with more than a few riders having trouble getting through the combinations cleanly. But the audience was treated to a clean round early when Shawn Casady, second in the order of go, went clear on Zephyr, owned by Wyndmont Inc.
Casady also put in a clear round on his second mount, Valinski S, and advanced to the jump-off on both. He was joined by six other horse-and-rider combinations to ride the eight-effort short course. Casady and Zephyr competed first, riding a tidy track but incurring a rail in the double combination. Marc Grock and Moonlite Beach LLC’s Little Gancho took to the field next and finished with no faults, but the 13-year-old Swedish Warmblood chestnut gelding took a bit of time in between jumps to play. The pair left the door open just wide enough for the next pair, Kenneth Vinther and his own Colicchio, a 9-year-old Holsteiner stallion, to take the lead. Keri Potter rode next on Julia Koetting’s 11-year-old gelding Bitalica, and was clear and quick to steal the lead from Vinther. But it was short-lived, as Christian Heineking put in a lightning fast round on NKH Caruso, a 13-year-old bay Oldenburg gelding owned by NKH LLC. Quick ground speed, extra tidy turns, and a stride left out of the first line allowed Heineking to shave almost 3 seconds off the previous leader. Parker successfully left out the stride in the first line on Vancouver 45, an 11-year-old chestnut Hanoverian gelding owned by Parker’s Cross Creek Farms, Inc., and she blazed a tight track everywhere else, to cross the timers just a hair faster than Heineking. Jeff Campf and Ninou 2, as well as Shawn Casady and his second mount Valinski S, both jumped off after Parker, but each had an unfortunate 8 faults, assuring Parker the blue ribbon. Parker intends to spend several weeks at HITS Coachella, take a break, and then return for the AIG $1 Million Grand Prix at the end of the circuit. See full results of the $70,000 Back On Track Grand Prix.